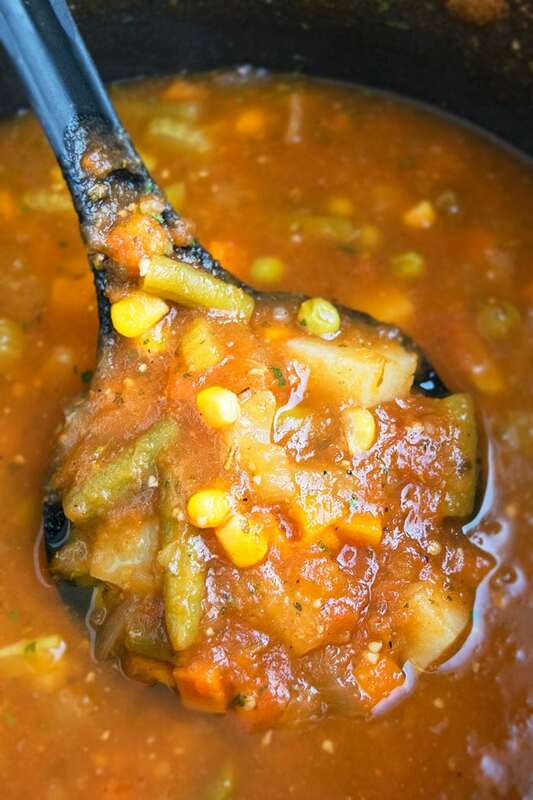 Quick and easy vegetable soup recipe made in one pot in less than 1 hour on stovetop, using simple ingredients. It’s healthy, packed with vegetables and Italian herbs and spices. 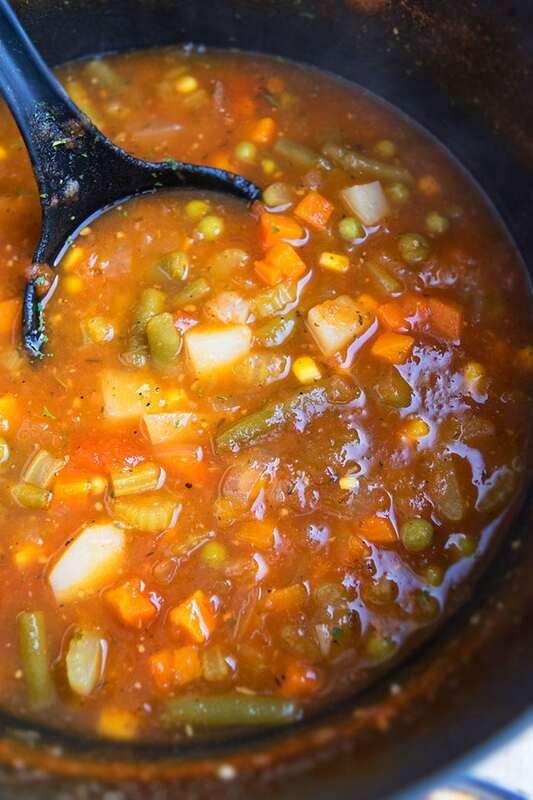 My mom has the most INCREDIBLE hearty vegetable soup recipe ever! I have tried many other recipes in the past but nothing ever comes close to this family version. -Use low sodium broth because regular broth can make the soup very salty. -Either vegetable brother or chicken broth can be used. -The amount of herbs and spices can be adjusted, based on your preference. -You can use any vegetables you like. To make vegetable beef soup/ground beef vegetable soup, cook ground beef first and drain fat. Then, follow rest of the same steps. To make chicken vegetable soup, add some shredded rotisserie chicken or leftover grilled chicken pieces in the soup at the end. To make turkey vegetable soup, cook ground turkey first. Then, follow rest of the same steps. To make vegetable noodle soup, add your choice of noodles when you add the potatoes until fully cooked. To make spicy vegetable soup, add red chili flakes, some sliced jalapenos or green chilies and paprika powder, based on your spice level tolerance. 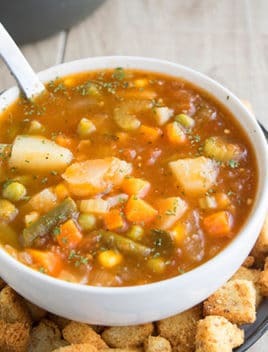 To make roasted vegetable soup, roast your choice of vegetables first and add use those in this soup. 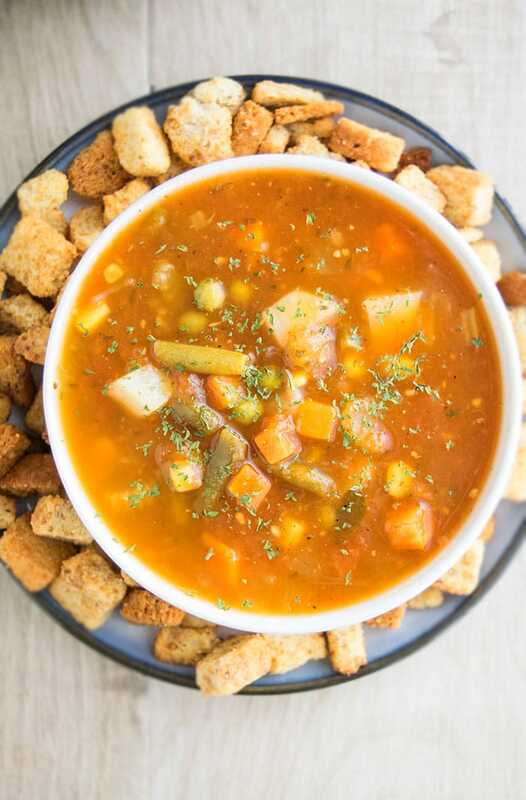 To make crockpot vegetable soup/ slow cooker vegetable soup, add all the ingredients in a slow cooker and cook on low for 5 hours. To make creamy vegetable soup, add some heavy cream at the end. To make vegetable barley soup, add 1/4 cup barley when you add the potatoes. Add some additional broth or water because barley absorbs a lot of liquid. To make tomato vegetable soup, add more tomatoes and even some tomato paste in this recipe. Keep it simple and these can be used fresh or dry. How to make vegetable soup? 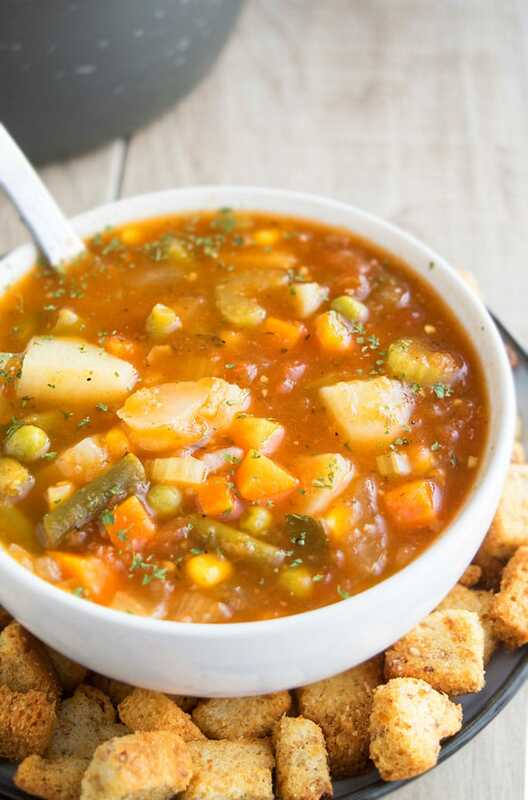 How do you make homemade vegetable soup? Saute onions, carrots, celery, ginger, garlic. Add broth, tomatoes, potatoes, seasonings and bring to a boil. Add corn and peas and cook again and enjoy! What vegetables to put in vegetable soup? What are the ingredients for vegetable soup? What can I add to vegetable soup to make it better? -Add heavy cream to make it super creamy and rich. -Play around with different herbs and seasonings to change the flavor. A mediterranean or Chinese twist is great! -Some people also like to add a bit of cooking sherry. 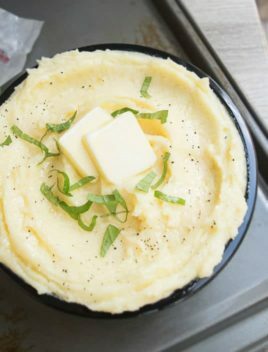 -Use flavored butter instead of oil to give it a deeper flavor profile. 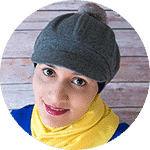 -Use different seasonal vegetables of your choice. What to serve with vegetable soup? 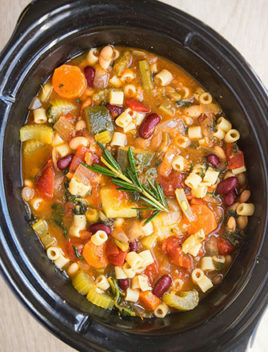 Quick and easy vegetable soup recipe made in one pot in less than 1 hour, using simple ingredients. It's healthy, packed with vegetables and Italian herbs and spices. Add oil in a large nonstick pot and heat it over medium high heat. Add onions, carrots and celery, ginger, garlic and saute everything until fragrant. Add broth, tomatoes, potatoes, bay leaves, parsley, thyme, oregano, rosemary, salt, pepper, red chili (optional). Then, add green beans and reduce heat. Cover and cook for about 20 minutes until potatoes become tender. Add corn and peas and cook for about 10 minutes. 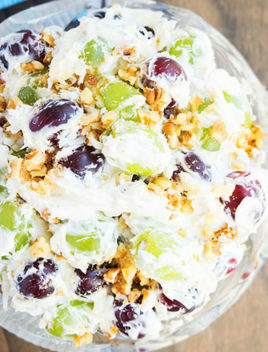 This recipe is so easy to follow and a huge hit with the whole family! You had me at easy!! Looks so flavorful too! Yum, looks so simple and tasty! 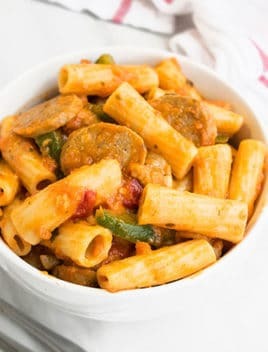 Love easy, family friendly recipes! This looks perfect! Soup never goes out of season at my house! I love a good soup even in the Summer! Great to change things up! I’m loving all these delicious ingredients! Quick and simple. I really like the flavor (it is not too bland). Tried it over the weekend. Family loved it. Excellent recipe. Very flavorful with the seasonings. My husband loved it! Great served with a sandwich or just cornbread. The seasonings really take a simple soup over the top. Happy to hear you guys enjoyed it.